In the absence of medical therapies, Yoruba women who fail to conceive consult a male diviner-priest (babalawo). Translated as "father of secrets" or "father of ancient wisdom," the babalawo performs the Ifa ritual to explain and reverse a woman's misfortune. Ifa, considered the most important and most reliable system of divination, enables supplicants to understand the will of the Supreme Being Olodumare (also known as Olorun or Creator God). Olodumare empowered Orunmila, the god of divination, to speak for the numerous Yoruba deities (orisha) through the diving ritual. During a consultation, numerical patters, obtained by passing sixteen palm nuts from hand to hand, are recorded on a divination tray. Each pattern corresponds to a sacred verse, of which there are 256, that contains both the prediction and the required sacrifice. The babalawo interprets these patterns. A diviner's equipment, carved by artists, includes a divination tray (opon Ifa), a tapper (iro Ifa), cups (agere Ifa) to hold the palm nuts, and a storage container for the sacred paraphernalia (opon igede). 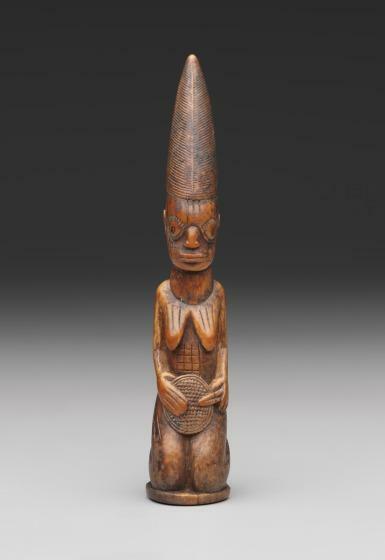 Yoruba sculptors typically carve the opon Ifa in the shape of a square, rectangle, or circle. The center of the tray is always depressed to accommodate pulverized wood or yam flour on which the diviner marks a deity's message in symbolic strokes. Geometric patterns or figures drawn from Yoruba mythology or daily life decorate the raised border. The hole bored into the top of this tray originally carried an "eraser" made of a cord of fifty cowrie shells that the diviner used to clear the tray during the divining ritual. Among the images on the raised border is that of the deity Eshu. Although only Orunmila knows God's will, it is Eshu—the divine messenger and guardian of the divining process—who carries the client's sacrifices to the deities and other spirits. He is placated with an offering at the beginning of the ritual and begged not to garble messages as that may cause catastrophe in the end. Eshu's image may appear once or, as exemplified by the elaborately carved Dallas tray, at each of the four cardinal points. He is depicted as a face and as a full-length figure wearing his trademark long-tailed cap and brandishing a club. Where only Eshu's face is depicted, he is wearing a half-shaved hairstyle with hornlike forms projecting from his head. The hairstyle and horns are symbolic. According to an oral tradition, because of his deep affection for Orunmila, Eshu interrupted having his head shaved so he could come to the aid of his friend. The horns symbolize Eshu's great generative powers. In addition to the four images of Eshu on the raised border of the tray, the sculptor carved a complex program of symbolic scenes depicting Yoruba royalty, religious rituals, and scenes from Orunmila's life. At the beginning of a ritual the diviner taps the edge or the center of the divination tray with an iro Ifa, or "tapper," to attract the attention of Orunmila, Eshu, and other deities, family ancestors, and ancestral diviners. Ordinary tappers are carved of wood, while those belonging to very successful diviners are made of expensive and prestigious materials such as copper alloy or ivory, like this one. The king (oba) held exclusive rights to own ivory, and only those who had his permission had access to this precious material. The conelike shape of the tapper clearly indicates that it was carved from the tip of an elephant tusk. In Yoruba thought, the cone is an ideogram for life force (ashe), which animates everything in the universe. It is therefore an appropriate form for an object that is used to invoke and celebrate all the spiritual forces present at a divination ritual. Ifa tappers invariably depict a female figure posed in the kneeling position wearing only waistbeads and modestly covering her genitalia with a decorated fan. The kneeling position is that of the supplicant, but in Yoruba tradition it also refers to an individual's existence before being born on Earth, when one knelt during the ritual of choosing his or her head (ori), the seat of one's destiny. There is also the profound belief that women are more effective than men in honoring, soothing, and cooling the gods so they will favor mankind. Roslyn A. Walker, The Arts of Africa at the Dallas Museum of Art (New Haven and London: Yale University Press, 2009), 108-109.